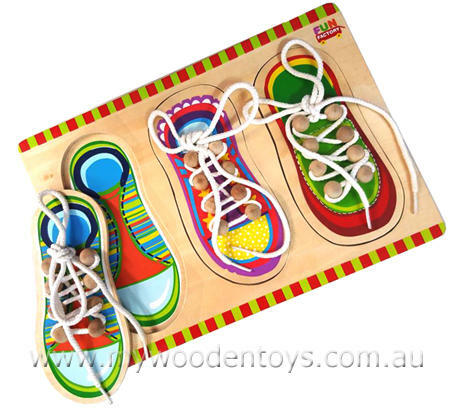 Lace Up Shoe Puzzle is a fun, clever, educational toy and a great way to learn that tricky business of tying a bow. Each lacing shoe is also a large puzzle piece that fits into it's place over a picture of it's unlaced partner. A great educational toy that is really fun. Material: Wood with Cotton Laces. We like this because: "Not only can you learn to tie bows but also you can lace the shoes up."